Home Mobile Android Android O: What’s New In The Latest Android Version? Android O: What’s New In The Latest Android Version? 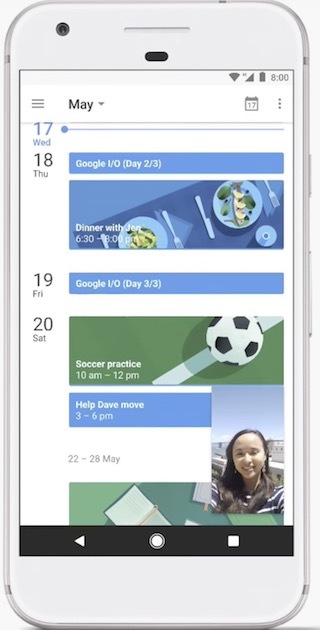 Google asserted the fact that mobile phones are slowly transitioning into full-fledged computers. However, due to the small size of our phones, performing certain tasks like multitasking has always been a problem. Fluid Experiences is Google’s attempt to provide us with a refined user experience which is not impacted by the smaller size of our smartphones. The theme here is to get more done, even with a small screen device. Multitasking on Android has improved over the years. With Android Nougat, Google introduced split-screen multitasking and with Android O, the search giant is introducing a new picture-in-picture mode. In apps like YouTube, Google Duo or Netflix, we can just press the home button to activate picture-in-picture mode. It will create a floating window which can be adjusted, resized and repositioned. While the floating window is active we still have access to all the features on our smartphone. For example, we can take notes while watching a tutorial on YouTube. This approach does feel better than the split-screen mode. However, third party app developers need to support this feature in their apps to make it really useful. Google wants to change the way we interact with notifications on our smartphone. Whenever an app receives a notification, besides showing it in the notification center, it will also show a notification dot on the app itself. It also gives users a new medium to interact with the notification. A long press on the app icon will show the notification right there in the form of a widget. Swiping the notification from the widget will also clear it from the notification panel. Auto-fill function has always been a part of Google Chrome browser. 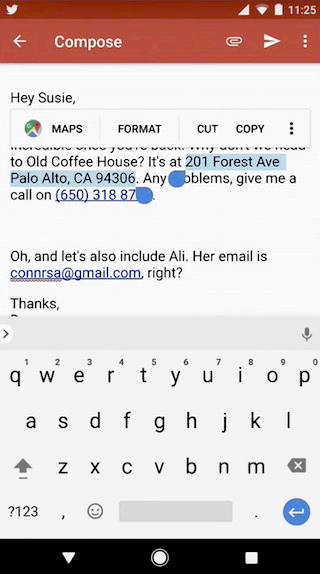 With this version of Android, Google is extending its auto-fill support to apps. 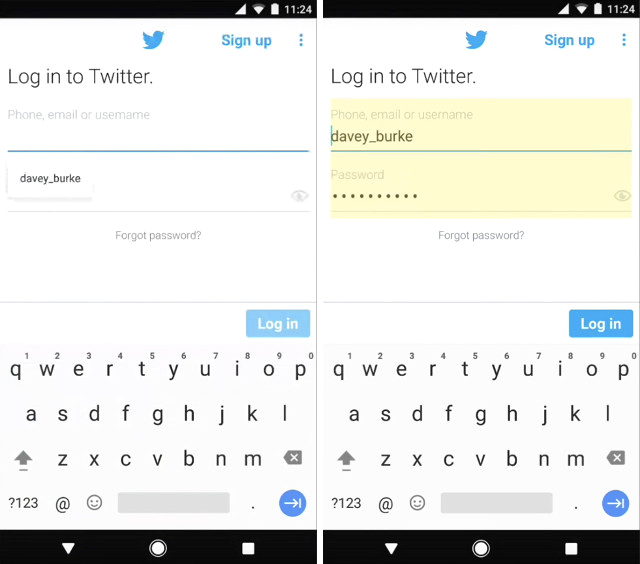 Suppose your login information for Twitter is saved on your Chrome browser. When you open the app for the first time on a smartphone, it will automatically pull that information from Chrome and log you in. This function will be really useful when you are setting up a new phone. Selecting a text to copy it on your smartphone has always been a pain. Fiddling with the selection markers to select the text is infuriating at times. According to Google’s user studies, phone numbers are most copy-pasted item followed by names and addresses. Google is using this data with its machine learning to create “Smart Text Selection” on Android O. Whenever a user double taps on a phone number, name, address, or email id, the OS will be smart enough to select the whole thing. Not only that, it will also bring contextually aware options. For instance, showing maps or dialer in case you selected an address or phone number. A handy feature indeed. I can’t tell you how many times I just chewed through my mobile data when I forgot to connect to my home/office WiFi. The only way to save ourselves from accidentally gobbling up our mobile data is to keep our WiFi on at all times. However, that is not an optimal solution. Android O brings a new feature which will alleviate this problem once and for all. Whenever your device is in the area served by a saved WiFi network, your phone will automatically toggle on the WiFi and connect to the network. It will save accidental mobile data consumption without you having to keep the WiFi on all the time. This feature is based on the data obtained through user’s location. 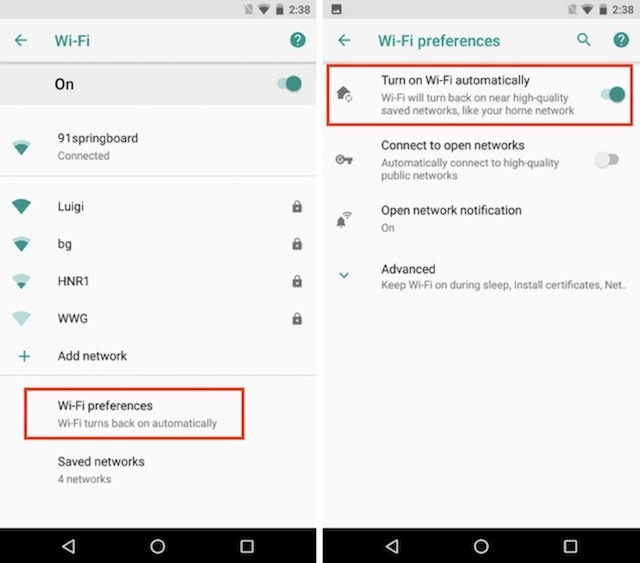 In Android O, you can turn on the automatic WiFi toggle feature by going into Network and Internet > WiFi > WiFi Preferences. 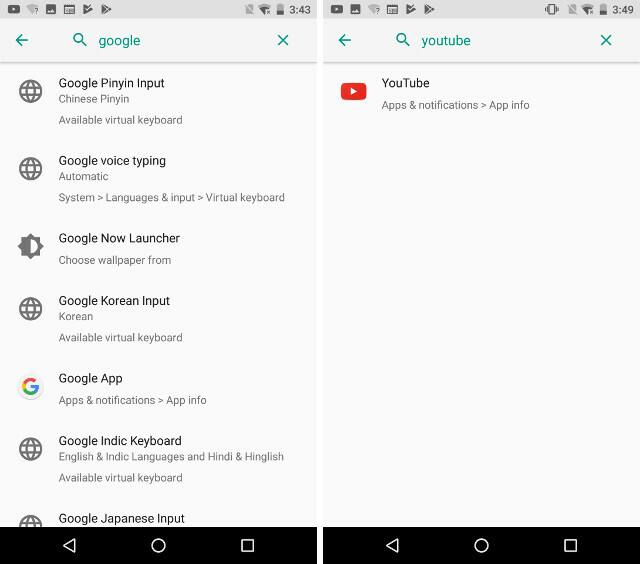 Google introduced search inside the Settings page in Android Lollipop (5.0) to make it easier for users to navigate through the Settings page options. With Android O, Google is giving users a more enhanced search feature in Settings. When you search for an option in the Settings page, the options will include a sub-text which will show you the path to find that setting. Also, previously if you wanted to see information about any app, you had to manually find the app sub-section in the Settings page and then scroll down to find the app. Now you can just search for the app and it will show up in the search result. Devices like Nexus and Pixel already enjoy certain fingerprint scanner gestures like swiping down to bring down the notification shade. Android O is going to enhance on this feature by adding horizontal swipes along with vertical swipes. It is not yet clear what functions they will perform but any added gesture support is welcomed. Also, unlike before, the swipe direction will not be affected by the device’s orientation. Whether you are in portrait or landscape mode, swiping down will have the same result. There are many apps which use the built-in screen overlay ability of Android to draw over other apps and provide us with features which otherwise would not have been possible. 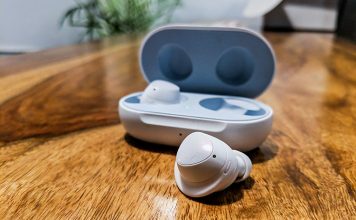 The best example of this can be seen in the pop-up bubble feature utilized by apps like Facebook Messenger and display calibration by apps like Twilight. However, this comes with several associated security risks. Apps may misuse this authority to display certain buttons or stop you from interacting with the device till they are active. To let the users know that an app is using screen overlay, Android O generates a notification whenever such an app is launched. You can disable the app just by tapping on the notification. A very handy and welcome feature. 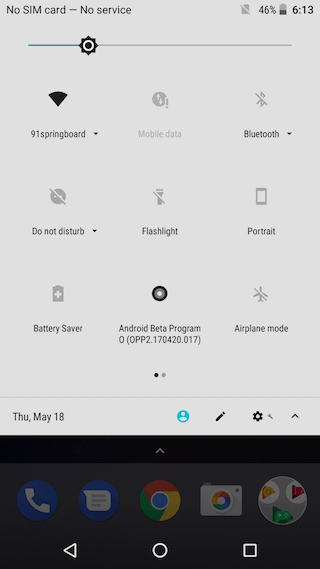 Although Android O builds on top of the previous Android versions and does not bring any major changes in the look and feel of the Android, there are some UI changes that really streamline the experience. One of the most visible UI change coming with the Android O can be seen in the notification shade. The notification and quick settings page now follow a grey theme instead of the earlier black and white theme. Also, the buttons to edit Quick Settings tiles, switch user profiles, and the Settings shortcut have been moved to the bottom of the notification page. This makes it easier to access them on a large device. Although Android has always allowed us to change our icon set by installing launchers and icon packs, it has never been an inbuilt feature. With Android O, Google has allowed users to change the shape of icons. Users still cannot completely overhaul an icon’s look but they can change the shape and size of the icons. For me, it’s a step in the right direction. Android brought contextual menu, like 3D Touch on iOS, in the form of long press in Android 7.1. Basically, a long press on an app’s icon lets a user access the app’s specific shortcuts. 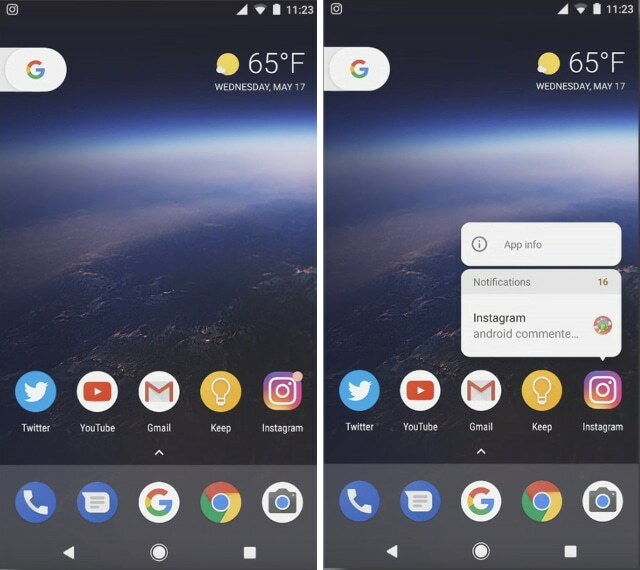 With Android O, now the user can access an app’s widget by long pressing on its icon. If an app has multiple widget formats, users can select which widget they want to see. Night Light helps reduce strain on our eyes in the night be reducing the blue light and increasing the red tint of the display. In Nougat, a user could only select when to turn the Night Light on or off. 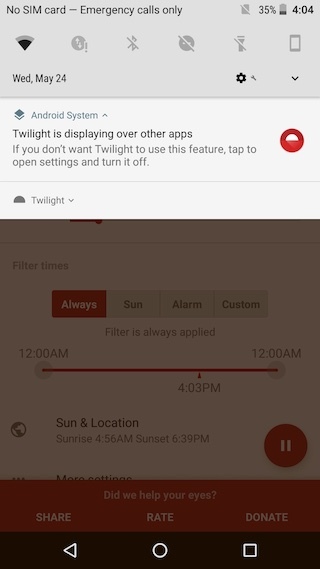 Android O brings a slider which can be used to adjust the intensity of Night Light allowing us to select the amount of red tint we want on our display. Location permissions are sought by many apps to function properly. However, it is not in our best interest to share our location data with all the apps at all the time. Since Marshmallow (6.0), we are allowed to change the permissions for an individual app. However, the function was buried deep inside the Settings menu. With Android O, Google has included a short-cut to location permissions on the location setting page itself. This makes it easier to manage app level location permissions. Every new version of Android brings major under the hood changes focusing on security, battery life, and performance improvement. This year it seems that these areas are the major focus point for Android O. Google clubbed all under the hood improvements into one category and called it ‘Vitals’. The concept is to keep everything which is vital for a smartphone’s performance in as good a shape as possible. Security has always been a main concern for Google, as the public perception tends to place Android as a less secure platform than iOS. With the launch of Google Play Protect, Google wants to dispense that perception. Every day Google scans all the apps present on every Android device (~50 billion/day). They disable or outright remove any app which is flagged for causing security problems. 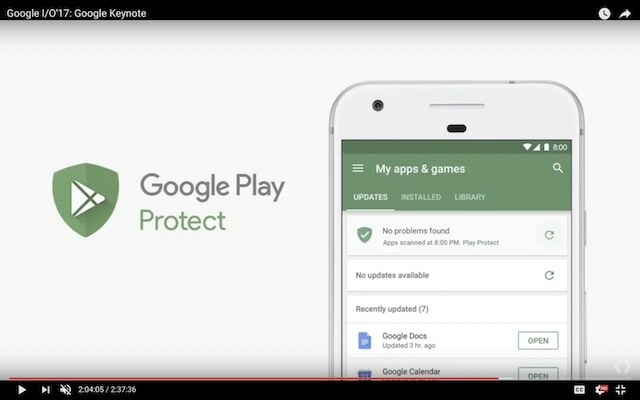 Google want to make this process visible to the public and hence, they’ve launched the Google Play Protect app. A user can launch the app and see the result of the scan of all the apps on his devices. Android O brings major improvements to the platform’s performance. 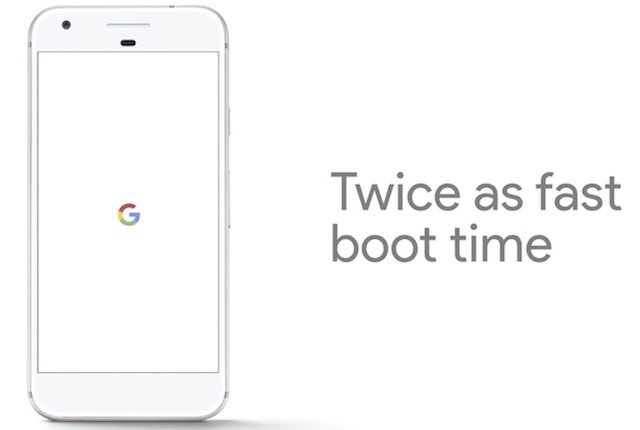 Android O running devices will boot twice as fast, when compared to current devices. Also, the app load time has been reduced significantly. The faster app loading time is due to change in the OS itself and hence, it will be applicable for all the apps present on our smartphones. Apps use a lot of data and resources while running in the background. This slows down the performance of a smartphone and drains its battery very quickly. Android O wants to stop this mismanagement of resources and battery life by introducing “Wise Limits”. 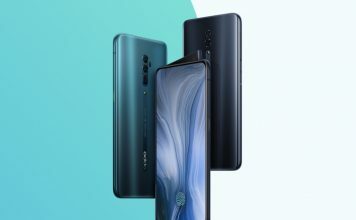 Basically, the OS puts a sensible limit to the amount of system resources an app can use, thereby decreasing the background drain and increasing the performance and battery life. 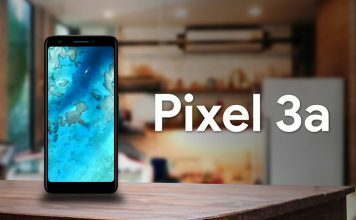 Google has been trying to fix the problem of Android fragmentation and updates since a long time and they have come up with a new solution dubbed “Project Treble”. The project, part of Android O, aims to make Android updates faster. We have already talked about Project Treble in detail, so check that out. Apart from the aforementioned changes and features, the first developer preview of Android O also introduced some other changes. You can read our detailed article on the same. Graphics driver updates from the Play Store might get to be one of the first implementations of “Project Treble”. 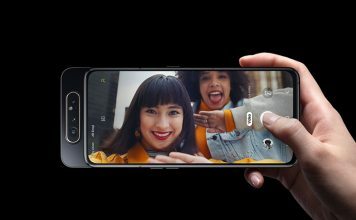 Since chipset makers will be able to push faster updates thanks to the “vendor implementation layer”, updating the graphics driver can happen through Play Store itself. This will also allow chipset manufacturers to send app-specific drivers update to solve glitches relating to that specific app. The only caveat of this feature is that it will only work on the devices which are shipped with Android O.
SMS authentication is imperative to our security, as it is used by our banks, messaging services, and even Google itself. Although important, SMS authentication still suffers from two major problems. First, we need to grant permissions to apps to be able to read our messages when they only need it at the time of authentication. This is a security flaw in itself. Secondly, the manual entry of code is not user-friendly, as sometimes you have to leave the app, remember the code and then come back to paste it to work. Also, it creates a lot of clutter in the messaging app. Android O is aiming to solve this problem by introducing a feature for app developers called PendingIntent. 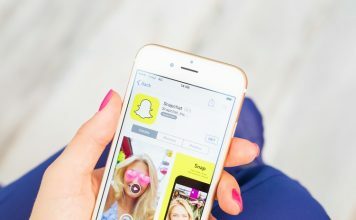 All we users need to understand about this feature is that now when an app requires an authentication, it will create a unique token which will be directly send to the application itself. You will never see a message in your inbox nor you will have to remember and manually enter the token. Android O is bringing a lot to the table. Of course, there are some features which are missing and it would be great to have them. A system wide dark mode was what I was wishing for. Still there’s a lot to like and I’m happy with Google’s latest offering. Do you like Android O? Tell us the features you love and the features you wanted in Android O in the comments section below.